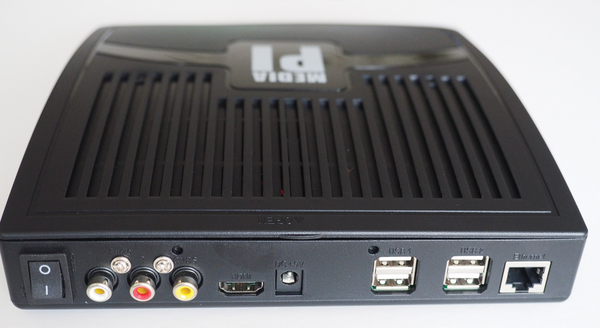 The Rasp Pi community has proven to be very creative in the design and production of cases , optimizing the cases they use by intended purpose. The cases that have been optimized for size have cable connectors located on the outer sides of the case. However, problems arise with very stiff cables. Using cables for HDMI, network, and USB at once pushes a case in all four directions, making the case difficult to assemble. Such problems only get worse when the configuration includes an additional active USB hub, because then you'll need at least one more USB hub cable and often another power cable leading to the nearest electrical outlet. When the dimensions of a case are not large enough to fit over a particular configuration, the Rasp Pi can look fairly messy. If you are looking for a solution that is tidy enough for a common living area, the MediaPi case from SB Components  offers a unique approach. The MediaPi case  comes with a power supply and adapter plugs for various countries and a set of English language instructions. 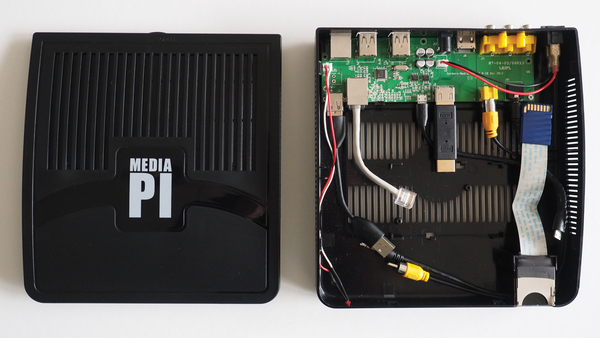 The case itself is made of plastic and takes up about six times as much space as a normal Pi case (Figure 1). Overheating is not a problem because the ventilation holes work very well. Figure 1: The cables are laid out so that they go from the Rasp Pi to a board that administers the active USB hub. A board with an active USB hub has been placed in the rear of the case and, as a result, almost all of the connectors for the Pi lead out from there (Figure 2). This choice of location for the connectors is created by running short cables from the Rasp Pi itself to the interior board. Only the ribbon cable for the SD card connector extends out from the front. Figure 2: With the exception of the SD card slot, all connectors for the case are located in the rear of the case. The cables are just right in terms of length and location for the Pi. Therefore, it is probably not necessary to read the instructions thoroughly. For stability, the Rasp Pi board is snapped into place with small plastic clamps. Because the case only uses one of the two USB ports on the Rasp Pi, the second port remains available for other purposes. You could, for example, connect internal bulk memory in the form of USB sticks, or you could connect a WiFi dongle. Because the case is made out of plastic, it does not block or shield WiFi signals. In general, the potential exists for the user to install several USB devices via a mini USB hub and then fit them all inside the generously sized case. Although the case is effective at making order out of tangled cables, the question arises as to the effect that the added electronic parts have on energy consumption, function, and performance. Measurements of electricity usage obtained by using a standard household device purchased at a home building supply store are no different with the case than without. The HDMI connector also functions without problem. where pi is the hostname of the Rasp Pi. The combination measures raw network performance and gives the theoretical upper limit for network throughput. On the application level, only part of this limit is available. Nothing conspicuous is shown in the measurements taken with and without the MediaPi case, meaning there is clean processing by the network connector on the additional board. The USB ports also function with the performance anticipated. The starting current of an external USB hard drive that caused problems on other computers also affected the MediaPi in the same way. Using a Y cable makes the drive run without any problems. The 3amp power supply that comes with the case works just fine to power the four ports and the Raspberry Pi. Building a Raspberry Pi-based laptop isn't difficult, but you'll need to gather some parts and follow the assembly instructions carefully. We show you how.